PRESS RELEASE: Yamaha makes portable digital drums available to more aspiring drummers with the release of the DD-45 at Winter NAMM. Designed from a drummer's perspective, the new model features four touch-sensitive pads and an AUX input for playing along with your favourite recordings on an MP3 player. 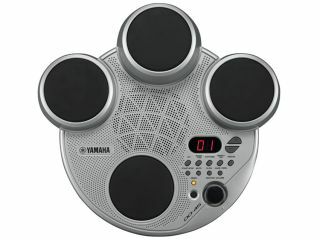 "It has been a number of years since Yamaha was in the entry-level digital drum market," says Dane Madsen, marketing manager, Yamaha Digital Keyboards. "But with the popularity of video games like Rock Band, more and more customers will be ready to test their skills on a real musical instrument. When they realize the limitations of the gaming drum pads, the DD-45 will be their next logical step." The Magic Tom feature lets users select from different Magic Tom fill sequences and perform multi-tom fills all on a single pad while they keep the beat going on the other three pads. Built-in auto-accompaniment patterns give you dozens of virtual bands to play along with. Recorded drum parts within the patterns can be muted so users can test their skills. The tempo of patterns can also be adjusted so users can begin practicing slow, then play faster as they improve - an important practice technique not available via MP3 players. "Consumers who are used to playing along with video games will feel right at home with all the backing-track accompaniment patterns of the DD-45," adds Madsen. "Plus, with the AUX input and an iPod, they can play along with their favorite bands with an unlimited supply of play-along content." The DD-45 is expected to ship in April 2010.